Dry eye disease is one of the most common eye disorders in the United States, afflicting millions of Americans and costing billions of dollars in pharmaceuticals every year. Dry eye occurs when the eye fails to produce tears, or when tears are of insufficient consistency and evaporate too quickly. Those suffering from dry eye can also experience significant inflammation of the eye surface, which can lead to pain, ulcers or damage to the cornea, with a possible loss of vision as a result. Symptoms of dry eye include stinging, burning or pain in the eye; a gritty feeling along the surface of the eye; strange discharges or excess tear production following severe outbreaks of dry eye; blurred vision; inability to cry; and eye fatigue. Considering how important eyes are for functioning properly on a daily basis, those who are beset with dry eye disease experience a dramatic loss in quality of life. Tears are essential for overall eye health, bathing the surface of the eye to keep it moist and free from dust and debris, and protecting it from bacterial and pathogenic infection. As a result, people with dry eye can not only experience discomfort and loss of vision, they are also at a much higher risk of developing more severe ocular conditions that can lead to chronic or permanent eye damage. It’s not hard to imagine, then, how desperate these people are to find a solution. As usual, the pharmaceutical industry has been quick to cash in on this condition with a plethora of drops and drugs marketed toward treatment of dry eye. Subsequently, vast amounts of money are spent on products like artificial tears; however, there is currently no therapy to actually resolve this condition. Doctors can try to plug the tear outflow ducts or even cauterize them closed, but this is a last resort and not without its own complications and dangers. After reading the above, you’re probably thinking there’s no hope and you might as well just poke the darn things out and be done with it. Well, we’re happy to tell you that there’s possibly an easier way to help prevent, or at least minimize, the symptoms of dry eye disease. Many reports suggest that dry eye is associated with vitamin deficiencies. Those who intentionally avoid consumption of fruits and vegetables are often vitamin A deficient, which has been linked to the onset of dry eye. Furthermore, not getting enough plant-based whole foods in your diet can increase your risk of zinc, folate, vitamin B6, vitamin C and potassium deficiency, all of which can increase your chances of developing symptoms of dry eye disease. The solution is simple: Eat more vegetables and fruit. Increasing consumption of complex carbohydrates from foods such as nuts, seeds, broccoli, brussels sprouts, potatoes with skin on, raspberries, apples and figs can ensure adequate levels of vitamin A in your body. Eating plenty of red, orange and yellow vegetables and dark leafy greens can provide a broad spectrum of nutrients, while bananas and nuts can ensure sufficient intake of vitamin B6 and potassium. Now that you’ve increased your intake of plant-based foods and are beginning to rebuild your health with ample vitamins and nutrients, you should turn your attention to the simple act of drinking enough water. Recent studies have determined that dehydration, in addition to causing a decrease in saliva production and urine concentration, also causes a reduction in tear secretion. This means that the less you drink, the more likely you are to develop dry eye. With this in mind, by simply drinking enough water each day, your chances of developing dry eye should drastically lower. Similarly, those already suffering from this condition may not be getting sufficient hydration, and they should seek to increase water consumption to around eight cups a day for women and 10 for men. Signs of dehydration include a dry mouth, muscle fatigue, dry skin, feelings of lethargy and dark or infrequent urination. Trying to up your water intake but can’t bring yourself to down yet another cup of water? Check out these six foods that will take your hydration to the next level! 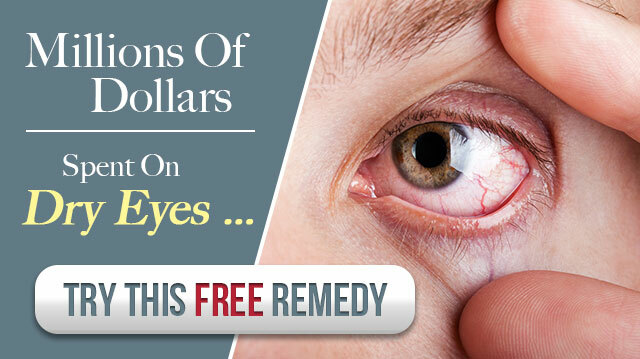 Hey Buddy!, I found this information for you: "Millions Of Dollars Spent On Dry Eyes…Try This Free Remedy". Here is the website link: https://www.thealternativedaily.com/water-best-remedy-for-dry-eyes/. Thank you.